Amanda’s note: In another recipe from her coconut plantation in India, Ramya describes a traditional use of rose for cosmetic purposes. For more ideas from Ramya, check out her website WildTurmeric.net. I love using rose water for making cosmetic preparations as it gives amazing results. Rose water made from pure pesticide-free roses has health benefits as well. It treats dry skin effectively and maintains the skin’s pH balance. It also prevents skin aging and fights off wrinkles and fine lines. The smell of pure rose water is so very relaxing and, especially if used at night, it relaxes you and assists with a good night’s rest. With all these skin benefits, it is no wonder that rose water has been a favorite for centuries, especially here in India. We use rose water in rituals, in cooking, and it occupies a special place in our beauty regimens too. Always try to make your own rose water — it is much cheaper and gives amazing results. I describe how to make your own rose water here. 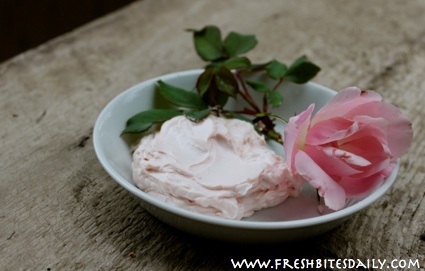 The color of this cream depends on the color of the rose water you are using. Damascus variety roses produces the best rose water as the rose water made with it gives the best fragrance and color — the cream smells wonderful and looks beautiful. Here on my property, there is a dark variety of Damascus rose and I always try using it for making my rose water for the beautiful pink color. If you want a beautiful pink color and a beautiful natural fragrance for the cream, try making the rose water using Damascus roses. 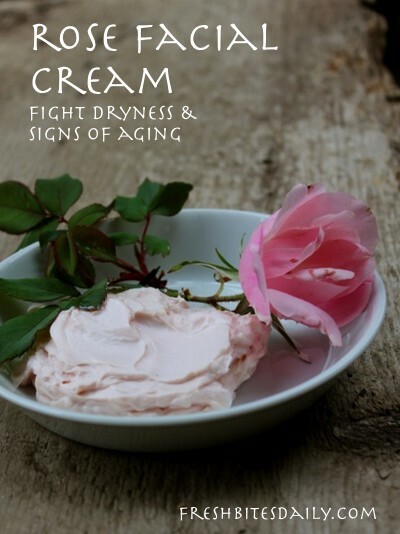 This cream is best used as a night cream as it nourishes the skin. It can be used even for the most sensitive skin as it does not have any skin irritants. Last time I made this recipe, it stayed well for over a month at room temperature. If you want a longer shelf life, you can store it in the refrigerator. I would suggest making smaller batches because the smell stays fresh that way. This recipe makes a perfect small batch that can be used within a month. This recipe also makes great gifts. If you want to make larger batches for gifting it to others, simply double the recipe. If you are making large batches, use a electric mixer to mix the ingredients together. Melt the bees wax on low heat along with the distilled water. You can also use a double boiler for melting, but I always melt it using a very low flame directly. Take the melted beeswax in a large bowl and start whisking using a hand whisk. Gradually add in the oils and rose water in a slow drizzle all the while whisking at a steady pace. The mixture will thicken as you whisk. Once all the liquid has been added and the mixture has thickened, stop whisking. Let the cream cool completely and then add the rose essential oil. Mix gently into the cream and store it in glass bottles. The whisking part is important to get a smooth cream. Keep the cream away from sunlight and store it in a cool place.